The results of my motivators assessment won’t surprise anyone who’s had the pleasure of my company. According to the assessment, I dislike bureaucracy and red tape. I’m not always a faithful follower of processes and procedures. Routine work leaves me bored. Being told how to do my job leaves me surly. Sticking with the status quo leaves me frustrated. When given marching orders, I invariably ask why the work’s important and wonder if there’s a better way to get the job done. I toss out an inexhaustible and sometimes exhausting volley of unconventional ideas from left field. In my world, reason trumps empathy. When given the choice, I’ll work on my own rather than join a team. And I have my moments when I’m overly controlling and suffering from an acute case of know-it-all-ism syndrome. So what’s the upside to having people like me on the payroll? Apparently, we can be the “lifeblood of innovation” in an organization. We’re driven to constantly put new stuff out into the world. Ease up on the rigid rules, give us the time and space to discover and pursue ideas and odds are good that we’ll hit you some homeruns. If these characteristics sound familiar, then welcome to the tribe called thinkers. We’re one of five workplace identities defined by Adrian Gostick and Chester Elton, authors of What Motivates Me: Putting Our Passions to Work and founders of a global training and consulting company that builds high-performance work cultures. Along with thinkers, you’ll find achievers, builders, caregivers and the reward-driven at work. Each identity has its own cluster of related motivators. For thinkers, our core motivators are autonomy, creativity, excitement, impact, learning and variety. For achievers, their motivators are challenge, excelling, ownership, pressure and problem solving. The authors worked with a team of psychologists and behavioral scientists who identified 23 workplace motivators by mining a decade worth of workplace surveys completed by more than 850,000 people. That’s good news for anyone who’s dissatisfied, disengaged and stuck in a rut. You don’t have to quit your job, hit the reset button and start over in a new career. “Many of the happiest people we’ve spoken with didn’t find their bliss down a new path; they made course corrections on the path they were already on,” say Gostick and Elton. The online motivators assessment takes about 20 minutes to complete. You’ll get a spot-on summary of what turns you on and off at work. The book then highlights the working conditions where you’ll thrive, offers strategies for tweaking your job and flags blind spots and potential conflicts that can derail your career. 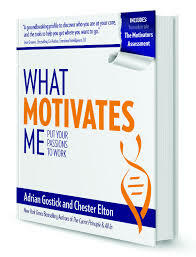 What Motivates Me is highly recommended for anyone who’s wrestling with two age-old questions – what is it that motivates me and what can I do about it? Twenty words of wisdom for public relations students based on 20 years of working in PR. Some of the advice was told to me. Others were lessons learned. Writing is a fundamental PR skill. Turning out clean, clear and compelling copy on deadline gets you to the front of the hiring line. Write and read constantly. Go on a steady diet of newspapers, magazines, books and novels. Start doing informational interviews long before you graduate. Ask for 30 minutes and talk with people who are doing your dream job. Ask for their advice and what they look for in new hires. Never ask for a job or leave a resume. Always send a thank-you card (not a tweet, text or email). In cover letters, it’s all about what you can do for the employer and not why the employer should hire you. No one owes you a job. Take the initiative and do your homework before a job interview (a surprising number of job seekers don’t do this). Google the employer and person who’s interviewing you. Ask smart and informed questions during your job interview. Make it more of a conversation than a monologue. Be friendly and polite with all the admin and executive assistants you meet before your job interviews. Sometimes, they’re asked for their opinion of you. First impressions count. It doesn’t matter if you’ve sent out 100 resumes and only received 20 rejection letters and four interviews. Smile and be enthusiastic the moment you walk into the room for your interview. Be the absolute best version of yourself. If you’re not excited when auditioning for a job, what will you be six months in when the honeymoon’s over and the routine sets in? Employers don’t care about your transcripts and grade point averages. They don’t care that you got the highest marks. They care about the projects you worked on for real clients. They care what your professors, the clients you worked for on class projects and past employers have to say about you. Competition for jobs is fierce. You’re up against college and university grads with the same or similar credentials. You’re also competing with working journalists. So what’s unique about you? What sets you apart from the rest? Tell that story in your interview. Focus more on what you did while you were in school and less on what you learned. Never speak ill of previous bosses, colleagues and classmates during job interviews. Always stay on the high road. You are what you tweet. Employers will check you out on social media so clean up your accounts. sexkitten@gmail.com, racist rants and Instagram pics of you getting drunk on a Thursday night will do you no favours. Your skills and education will get you the interview. Your attitude will get you the job. Your boss is hiring for fit. Can they see themselves working with you for eight hours a day? Will that experience be energizing or exhausting? Hiring isn’t a whole lot of fun. It’s wading through hundreds of resumes. It’s long hours in a windowless room asking the same questions over and over. And all the while, work is piling up back in the office. Be the low-risk and drama-free candidate that the employer is hoping will walk into the interview room. Hiring is a high-stakes proposition. Your boss wants to be known for spotting, hiring and developing great talent. Your boss isn’t your mom or dad and doesn’t want to be your best friend. Keep it professional at all times. Pay your dues. Be one of the first to arrive and last to leave at work. Be willing to work nights, weekends and however long it takes to get the job done. Your commitment will be duly noted. Don’t expect gold stars and constant praise from your boss. Doing an outstanding job to the absolute best of your abilities should be its own reward. Keep learning and stay curious. Stay up on the latest trends in PR and your industry. Shamelessly steal great ideas. If you’re not writing the annual report and business plan, read it cover to cover. Match your work to your employer’s priorities. Be good at everything and great at one thing. Play to your greatest strength and do it better than anyone else. Build your reputation around one area of expertise that it’s heavy demand and short supply. Aim to hit a home run once a year with a cool career-defining project at work or in the community. Do something that will wow a future boss and impress your kids and grandkids. Treat everyone with respect. If you’re not getting respect in return, start looking for a new job. Life’s too short and you deserve better. This review was first published in the Nov. 10 edition of The Hamilton Spectator. David doesn’t needs a slingshot to take down Goliath in 2014. He only needs a Twitter account. Thanks to social media, David and Goliath have traded places. 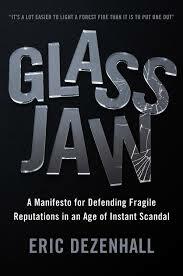 “Technology has made us more self-important, empowered and promiscuous in our ability to injure targets,” warns Eric Dezenhall, founder of one of America’s leading crisis management firms and author of Glass Jaw. What we end up with is a reputation-shredding Fiasco Vortex. “The Fiasco Vortex is one part crisis and three parts farce, the farce encircling the crisis and whipping it into an exponentially destructive beast beyond mitigation,” says Dezenhall. Think of a crisis as an iceberg, says Dezenhall. What you see above the waterline are the much-hyped PR and communications tactics of crisis management, the majority of which are of no value whatsoever. “What remains unseen is often more important than what is seen, and the best damage control efforts are often resolved discreetly. Most crises that are successfully resolved are resolved due to business and operational considerations.” Smart organizations keep these considerations quiet. You won’t find their tactics laid out in case studies and showcased at conferences. This isn’t your book if you’re looking for how to manage a crisis in 10 easy steps or need reassurance that a crisis is an opportunity. But if you want to survive your darkest days and emerge with your battered reputation still intact, Dezenhall’s brutally honest facts of life memoir is required reading.